St. Peter&apos;s Island has a volcanic origin; for this reason the sea depths are very diversified: here you can find wonderfull shallows, caves, vertical walls, and sandy seabeds, ideal for courses, as well as grasslands of posidonia with large concentrations of pinna nobilis. This variety of diving sites can satisfy the needs of both beginners and the experienced divers. Fans of underwater photography will find great satisfaction thanks to this rich flora and fauna and the presence of pelagic fish. 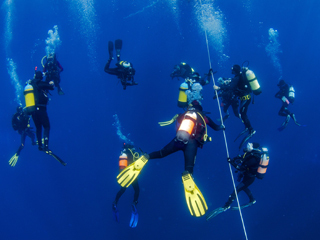 In order to offer the best service and maximum safety, the dives are conducted in groups of a maximum of 5 divers with a trained dive-guide, able to explain the features and beauty of the sea depths. We organize half-day diving excursions, in the morning and in the afternoon and night dives. We also offer guided excursions for non-divers who want to go snorkeling (with fins, mask and snorkel), even at night, to visit the beautiful coast of the island. Click on a flag to see the description! Descending down the walls of this hill of volcanic rock from a few meters to about 38-40 meters, on the sand. Continue diving along one of the many gullies, parallel to the emerged rock, you can find on the bottom an alternating series of big boulders that create amusing passages. The presence of current can sometimes make diving very challenging. However, the corrent guarantees the presence of many species of fish from both den that step and that can make this dive sensational! Also notable the micro fauna: wanderful walls full of parazoanthus, colorful sponges make it a great place for environment&apos;s photography and macro.